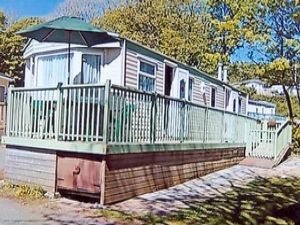 Our privatly owned caravan is situated 1 min from the private beach, it has decking with patio table and chairs and a ramp for wheeled access, the lovely bay overlooks Caldey Island, with the headlands either side for spectacular views across the bay. Close by there is a shop and launderette, there is a entertainment complex with indoor pool, which has recently been refurbished to a high standard, with daily children's and adult entertainment programs throughout the season, there is a bar and restaurant also in the complex. The caravan is equipped with many extra's including children's board games and books for adults and children, there is also beach chairs, and a beach wind breaker 1/2 tent, spare towels and tea towels in the caravan for you to use, all beds are made up with fresh bedding as required, i.e. 1 double and 4 singles, or 3 doubles, ready for your arrival which is after 2pm (we have to allow for bed making etc). There is also a selection of condiments in the kitchen for you to use, with all the pots and pans, cutlery and dishes you might require for your stay, our caravan is home from home so come and join us, here at Lydstep Beach and have the Holiday you DESERVE! Clubhouse passes available at extra cost, apply for details! This listing for a privately owned static caravan rental has been viewed 24565 times.